A year ago, as I was reading Ginsberg's paper on AlphaBeta pruning, I realized Gnubridge did not implement the "deep" pruning, making our implementation quite inefficient. As I set out to add this new feature, I realized the search code was a mess (errr... has incurred substantial amount of technical debt), and put it off until I had more time to restructure the code. As it turns out, I did not have a substantial block of spare time in over a year, and as a result, Gnubridge had no updates at all. Once again, I've been humbled for not following XP's practice of small steps. Fear not, this weekend I reentered the ring, with a plan. First, I isolated the AlpaBeta pruning logic from the main search class, DoubleDummySolver. Then I attacked the AlphaBeta pruning itself, only to realize that it was a mess as well. Which brings me to the subject of today's post: working out a Domain Specific Language (DSL) for tree manipulation. 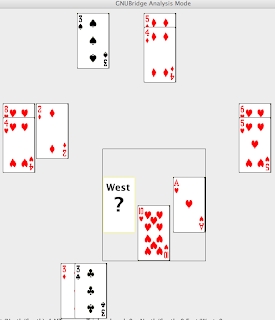 At the root, we have West to move, with two choices of cards to play, represented by nodes, 0 and 1. When choice 0 is made (and perhaps following full evaluation of node 0), we find out that West has scored 1 trick (that's the value of the max function at node 0, from standard computer science terminology). If, on the other hand, West makes choice represented by node 1, the next move belongs to his opponent, South. South, in turn also has two choices, and for ease of navigation, I chose to name them node 1_0, and node 1_1. This is to represent node's location in the tree from root: first take choice 1, then 0, arriving at node 1_0. It's probably not relevant, that at 1_0 and 1_1 East is to move, but what's important, is that after fully evaluating node 1_0, we find out that West has scored 0 tricks (value of max function is 0). It's at this stage that we have enough information to make a decision to forego the evaluation of node 1_1, which is the core idea behind Alpha Beta pruning. Isn't it perfectly clear that this code builds a tree as per diagram? Ouch... This suffers from the same problem as the example in the previous post, where the solution was to abstract the test code into Beharior Driven style of GIVEN... WHEN... THEN. Alas, it's not so simple in this case, because we need to construct a tree and populate it with information while at the same time exposing all the relevant details in the test. I hope that's readable to developers that come after me, and certainly to me a year from now. The complete code is in the AlphaBetaTest class for now, but it will probably be pulled into some reusable test class eventually. The reason for this leap in expressiveness is that there's certain amount of useless ceremony around the domain objects, and that ceremony detracts from clarity of intent. By enforcing a strict BDD style on the tests, it's harder to be distracted by the ceremony. BDD puts focus on how the domain is modeled in human language, not in the code. The code model is decoupled from the spec by methods describing the context: givenBidding(), andPlayersCards(), and expectPlayerToBid(). One payoff of this approach is that hundreds of unit tests do not have to be modified when some aspects of the model are refactored. Another result is a set of test that can be shown to domain experts for verification. Both of these give boost to productivity. Gnubridge has picked up a lot of momentum lately, and so I think it is time to define what it is and what it is going to be over the next few years. In many ways Gnubridge is still very immature, and so its version number is modestly kept below 1.0. This vision statement should help narrow down what it's going to take to make a 1.0 release, by giving the principles by which features should be prioritized or outright rejected. Please help shape this document by giving your input. Multiplatform deployment. By using Java and staying platform-agnostic, Gnubridge is available anywhere where Java runs. Gnubridge will be a strong opponent and a strong partner. What's under the hood is more important than the user interface, and enhancements in both bidding and deal playing will be given priority. Simplicity through ease of user experience. 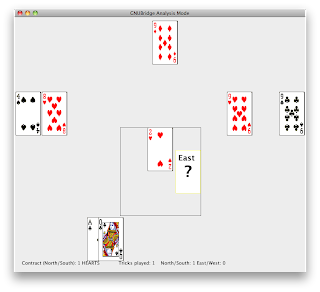 It should be ready to go out of the box: no configuration, no questions to answer for the users (like Gnuchess). New options and graphic interface features should be introduced with caution, with original behavior being the default on each upgrade. It is better to support fewer features than to confuse a mainstream user with obscure options and buttons. As a result, Gnubridge should not have many intimidating menus characteristic "rich" interface applications, and advanced options should be hidden far away from the user. Simplicity through deployment. Gnubridge should be distributed and run as a single file (unlike Gnuchess). The project will err on the side of including fewer features rather than making installation and management complicated. Also, no platform-specific installation packages will be supported at this point. Frequent, small, releases. If a piece of functionality provides value to players, it will make a separate release. One or more releases a month should be the norm. No bugs. Bugs will be fixed first. Automated tests will be written to expose bugs. Gnubridge also has another community it serves - the developers. It should give developers a chance to demonstrate their skills, learn from each other, push the state of the art in game playing algorithms and apply agile development methodology on an open source project. Test driven development, collective code ownership, simplicity of design, and refactoring will be practiced on the project. Automated tools will provide additional feedback on the overall state of code. These will include continuous integration, static analysis, and test coverage. Here is a brief sketch of what the future looks like. Target date: April 1, 2010. Gameplay to implement most of American Standard convention, as covered in Pavlicek's Bridge basics. Support for doubles and redoubles. Duplicate bridge scoring. User features: save and load a game. When restarting load a last unfinished game. Replay and rebid a game. Reset score. Force a computer to play before allotted time runs out. Community: rss feed for Gnubridge updates. Development: save junit results on CI server. Meet the target code coverage metrics. Target date: January 1, 2011. Gameplay to implement American Standard and most other conventions with options. Bidding to include explanations. Double-dummy solver to include partition search. Double-dummy to include explanation of moves (for analysis mode). 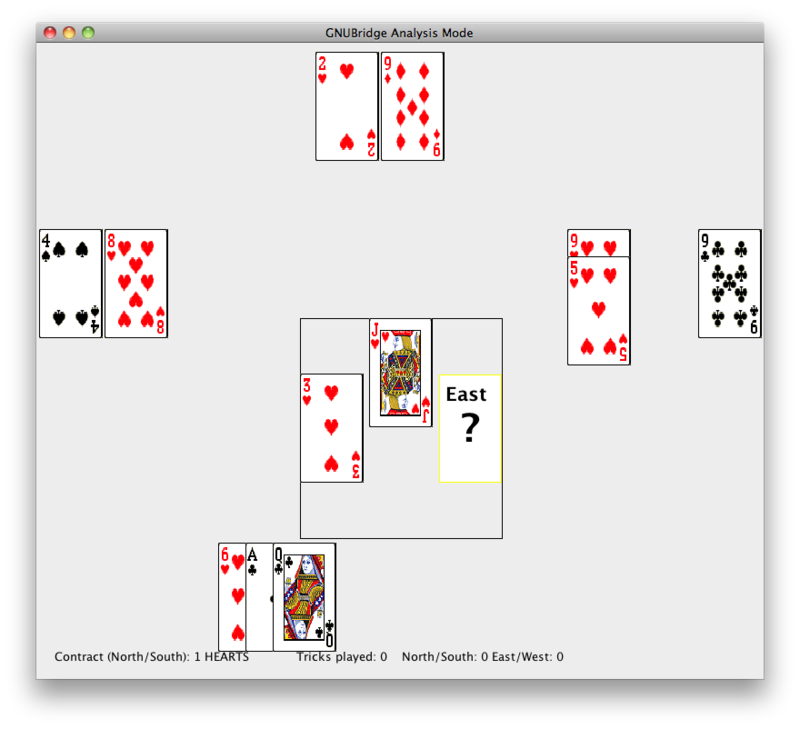 User features: analysis mode allowing user to configure cards in a deal, force that certain cards are played, take back a move, and get computer recommendation. Community: vote on features, easy feedback, easy debugging. Development: static analysis tools, produce crap4j metrics, produce Emma plugin metrics, migrate to github, migrate CI to runcoderun. Network play: play with any number of partners against each other or computer. Search algorithm no longer knows everyones cards. 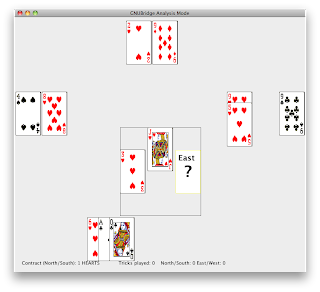 Gnubridge enters a tournament against other computer programs. Was it worth the time? The first implementation seems pretty straightforward, but one level deeper, looking at the methods getValidBidFor6LongSuitOrDecent5(int x), etc., there was a lot of duplication and murkiness. Duplication of logic and multiple responsibilities can be inferred from method names. Also, I could not make it clear what the parameter passed to the method was (as you can see below, it was bid level). Take a look at the following two methods, and note how murky they are. Method name is the only thing that can explain what is happening, the code itself is doing too much to make it easy to follow. The two additional methods not listed, followed the pattern in getValidBidFor6LongSuitOrDecent5(). There's logical duplication in what these methods are doing. It's around placing a valid bid based on a set of suits meeting certain criteria. This code didn't just get slapped together. Up to this point I was being very meticulous, and have already taken several refactoring passes through it. And yet it was smelling. The top level method is more readable than the version in the beginning of this post and in the process I got rid of nearly 20 lines of duplicated logic. Was it worth the extra 90 minutes that it took? The standard argument brought up is that 90% of code's lifetime is spent in maintenance mode, so we get a large return on effort investment over time. This may seem a bit academic, so let me give a couple of personal practical reasons. First, I can now go much faster with the next steps. This rule is far from being done, and lumping along 30% duplicated logic as I was implementing more and more cases would make it harder to maintain and more likely that I'd add even more duplicated logic. Having a clean picture right now lets me easier identify when the code gets messy again, and attack it. Second, I would like to attract more developers to the project. If a researcher wants to popularize his work, he better invest the time to prepare a good seminar to present that work. The first version of the code was pretty solid, and was passing all the tests. But it is somewhat equivalent to taking lab notes to a seminar and improvising in front of the audience, in hopes of conveying the idea. I have tried explaining complicated problems to a lecture hall of 100+ students, and it takes a lot of preparation to even get to the point where just a fraction of the audience can be reached. A good lecture will take a complicated problem, break it down into simple chunks, and convey the material in a language that the audience can understand. While it takes a long time to prepare, it is very rewarding to the speaker and the audience. I think leaving clean code behind is a necessary step in engaging developers with Gnubridge. [...]you may be able to make a suit overcall. This is done by bidding your suit at the cheapest level possible. A suit overcall at the one level requires 10-18 points (distributional points included). Further, if your strength is toward the minimum range (10-12), you should have a decent five-card suit — at least Q-J-x-x-x — or any six-card suit. A suit overcall at the two level requires about 13-18 points, and here the suit quality is even more important. If your strength is minimum (13-15), you should have a good five-card suit — at least A-Q-J-x-x or K-Q-10-x-x — or any six-card suit. If your right-hand opponent opens the bidding one of a suit and you have a five-card or longer suit (excluding the enemy suit), you may be able to make a suit overcall. This is nothing terribly fancy, no domain specific language, just some appropriately named methods. The whole experience took about half an hour, and if you go back to the original specification, it is much clearer now why Gnubridge is still far from supporting Standard American bidding convention. Human language, especially when spoken by an expert, is incredibly dense. This is just an illustration of what has been a common experience to me in translating from user stories to code. Another realization I had was how much easier it would have been to just go ahead and code it into a convoluted web of nested IFs and method calls. This was a small piece of a small bidding rule, and my time on the project is limited. I'm sure Gnubridge code is littered with this sort of unreadable garbage, and it was just a lucky call that made me rewrite it somewhat clearer. It seems like combating this sort of unreadable code is an uphill battle. I know we have coding standards, static analysis tools, peer review, etc. at our disposal to maintain code quality. And yet, based on this example, the code seems to naturally tend towards a chaotic mess. The expressive and readable code that comes from proper division of responsibilities is just an ephemeral occurrence, an unstable equilibrium about to roll back into chaos soon after attentive eye of a developer focuses away. East will take the next trick with 9H, but the last trick will be captured by South. The correct play to North's JH in the first example would have been 9H, leading to the last two tricks being captured by East/West. Therefore, the above strategy is flawed, and should not be used in reducing the number of positions to analyze by double-dummy solvers. As I understand this strategy is often taught to beginning bridge players, and it is still quite relevant in single dummy bridge, it's just that it is not always optimal. If a player possesses knowledge of distribution of all the cards remaining in play, he should avoid this mental shortcut in his analysis. I have seen this strategy advocated in one other paper . While it seems intuitive, it is flawed. I implemented it in Gnubridge, and the stochastic equivalency checker quickly found counter examples. Take a look at the following position. West is to play and the trump is NT. If West follows the pruning strategy's advice, he'll play 4H and the pair will eventually lose the last trick when West plays 2D. If West correctly played 8H, the pair would win all tricks, by simply running the remaining hearts on East's hand. Now the question remains - can this strategy be amended to only apply to cases when the opponent is winning the current trick and his high card cannot be beaten?